MacOdrum Library - Carleton's Institutional Repository: From forest and agro-ecosystems to the microecosystems of the human body: What can landscape ecology tell us about tumor growth, metastasis, and treatment options? 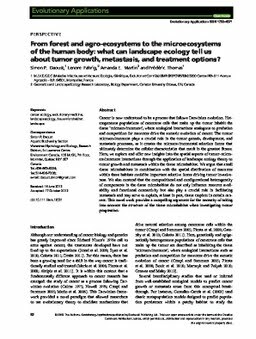 From forest and agro-ecosystems to the microecosystems of the human body: What can landscape ecology tell us about tumor growth, metastasis, and treatment options? Cancer is now understood to be a process that follows Darwinian evolution. Heterogeneous populations of cancerous cells that make up the tumor inhabit the tissue 'microenvironment', where ecological interactions analogous to predation and competition for resources drive the somatic evolution of cancer. The tumor microenvironment plays a crucial role in the tumor genesis, development, and metastasis processes, as it creates the microenvironmental selection forces that ultimately determine the cellular characteristics that result in the greatest fitness. Here, we explore and offer new insights into the spatial aspects of tumor-microenvironment interactions through the application of landscape ecology theory to tumor growth and metastasis within the tissue microhabitat. We argue that small tissue microhabitats in combination with the spatial distribution of resources within these habitats could be important selective forces driving tumor invasiveness. We also contend that the compositional and configurational heterogeneity of components in the tissue microhabitat do not only influence resource availability and functional connectivity but also play a crucial role in facilitating metastasis and may serve to explain, at least in part, tissue tropism in certain cancers. This novel work provides a compelling argument for the necessity of taking into account the structure of the tissue microhabitat when investigating tumor progression.